While there are many culinary delights considered representative of Chicago, so far as I can tell the city has never declared any of them to be the official food of the city. This oversight strikes me as odd, as governments LOVE doing this stuff for the easy, fluffy, positive PR. The bald eagle has been America’s national bird since the late 18th century. Illinois more recently declared popcorn its official state snack in 2004 (huh? ), and more recently, Governor Rauner declared pumpkin to be the official state pie in August (umm, why not?!). 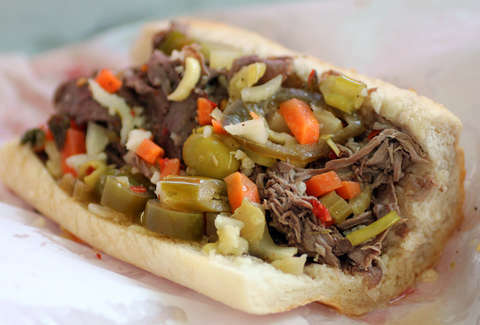 Well, I’m starting the grassroots campaign right now: Italian beef ought to be the national* food of Chicago. *”But Chicago isn’t a country!” you rightly point out. Technically correct! But “national” has a better ring to it. Consider this a move to get out ahead of the forthcoming breakdown of all societal structure, when water shortages and other nastiness force Chicago to persevere as a nation unto itself. But that is an incredible idea for a Jim Belushi-backed film franchise for another day. “But what about deep dish? !”, you exclaim, hypothetical Chicagoan arguing with me. If one conducted a nationwide, Family Feud-style poll and asked people to name Chicago foods, the survey would undoubtedly say deep dish pizza is right there at the top. It’s also undeniably delicious, especially on a cold night when you have no intention of doing anything but staying inside and pushing your personal limits of carb and cheese consumption. But here’s the thing: many (not all, but many) Chicagoans will tell you that their first pizza love is the thin, cracker crusted, square cut pies -- perfected by long running neighborhood joints like Vito & Nick's. Deep dish is more like a special occasion treat (that occasion often being out of town visitors who want to try it for the first time). 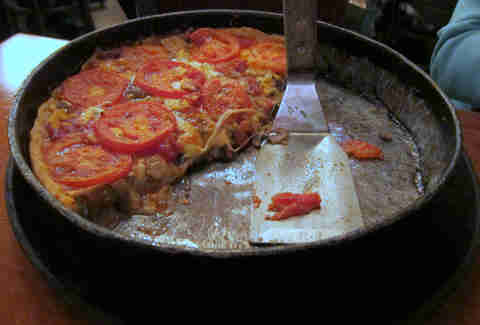 I’ll defend deep dish against narrow-minded outsiders until my last breath, but more often than not, when I’m craving pizza, I’m reaching for deep dish’s skinnier little brother. Hot dogs though! Chicago was once hog butcher to the world. People were willing to sell their kids for a spot in line at Hot Doug’s (RIP). And your heart invariably flutters just a little when you see a Vienna Beef sign, which either indicates excitement or that fact that processed meats have become a bit TOO central to your diet. 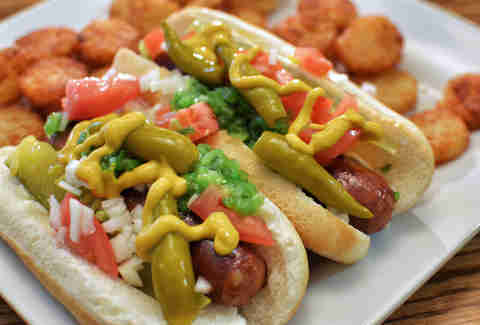 However, there’s also a hidden divisive aspect to the humble hot dog, and that division is ketchup. Now, most right-thinking Chicagoans (myself included) believe it is blasphemy to let so much as a drop of ketchup make contact with a proper hot dog. Ketchup requests at authentic dog joints are typically met with reactions varying from gentle ribbing to outright refusal. Thus, Chicago’s “we like ketchup” contingent is forced to the margins, forced to feel sheepish about a simple -- wrongheaded, but simple! -- food preference. The official Chicago food should not divide us, but bring us together. Which brings me to Italian beef. From an early age, Chicagoans are groomed to view it as a symbol of not just deliciousness, but togetherness. Kid’s first birthday party? Graduation? Family reunion? Rogue uncle released from jail? Odds are strong that those gatherings included multiple aluminum tins of thin-sliced beef swimming in juicy amazingness, along with bag after bag of soft Italian rolls cut to just the right size so that you could always talk yourself into one more. Especially when your aunt implores everyone to please finish it off because she’s “dieting” and doesn’t want leftovers. And it’s not just about group get togethers. Obviously the pinnacle of beef perfection comes when you visit one of the finest beef joints in the city (or suburbs, hey Johnnie’s!) and order up one to share with... no one. Yet even the individual ordering process is inclusive on a certain level, expressly designed to cater to a wide range of tastes and preferences. Hate mess? Get it dry instead of dipped. Afraid of spice? Go with the sweet and hold the giardiniera. Love cheese? It’s not really classic, but no one will hold it against you if you throw a couple slices of provolone on there. Despise veggies? Fine, hold the sweet peppers, too. Vegetarian? Umm... here’s some giardiniera and peppers on a dry roll? Sorry, this is still Chicago. 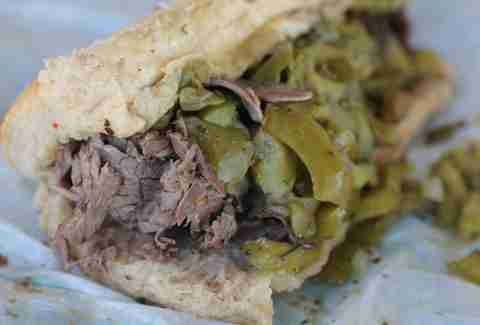 Beyond its ability to appeal to Chicagoans of all stripes (well, all carnivorous stripes), Italian beef feels the most distinctly Chicagoan among the holy trinity of local indulgences. Before the proliferation of the Travel Channel and Food Network devoting entire shows to the nation’s regional sandwiches and the rise of, well, sites like this one, you’d be hard pressed to find an outsider who knew what the hell it was, and even now it lags far behind the other two in the proportion of tourists that make a point to try it during their visit. Quite simply, Italian beef is ours. From its humble origins as a staple of factory workers to its ascendance as a delicacy prized by everyone from white collar office drones to... still factory workers, it’s inextricably woven into the fabric of the city, mostly in the form of stubborn shirt stains. Good people of Chicago, I come not to disparage the deep dish, nor humiliate the hot dog, but it is clear as ever that Chicago’s official food ought to be Italian beef. Everyone start the letter writing campaign while I pitch Jim Belushi on my hot script idea. 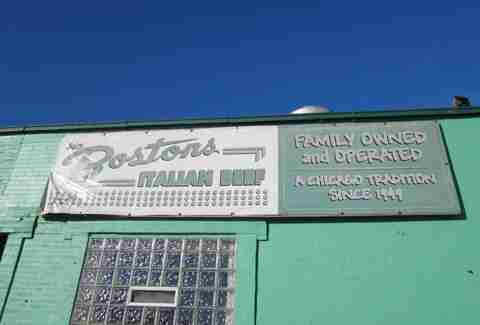 Deputy editor Matt Lynch’s current favorite Italian beef comes (oddly enough) from Joe Boston’s. Tell him where he should eat his next one @MLynchChi.